Moving house is a hugely time-consuming process, even if it’s only a short move across the city. Rather than finding the cheapest home moving service available, it’s important to see one who you can trust to transport your belongings safely. Quick & Easy Moving commit to treating your belongings as if they were our own. We go above and beyond to ensure that none of your precious items is damaged, scratched, dented, or lost during the move. We understand that your belongings are irreplaceable memories. All of our trucks and moving equipment are kept nice and clean, free from any traces of dirt so that you won’t have to clean any of your items once they arrive at your new home. When you are moving household, our polite and well-trained movers take care of the heavy lifting for you, letting you relax and not stress about how to get everything in its rightful position. We correctly move bulky items in and out of the truck, and then organise them into the right room for you, placing the items exactly where you wish to position them. We love to provide the best service for our customers, can go the extra mile any chance we can. 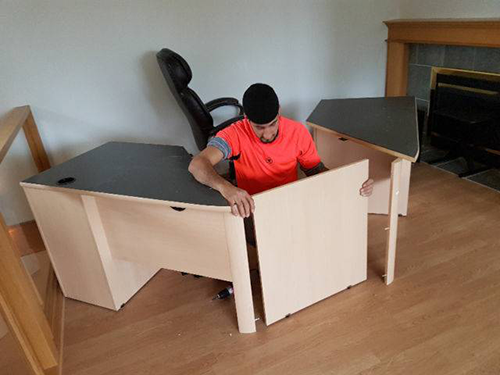 If you need any assistance with assembling furnitures, such as bed frames or bookshelves, we can help with your needs. If you are apartment moving and have a lot of stairs or an elevator, there is no need to worry. Quick & Easy Moving have extensive experience with condo and apartment moves and will make sure that all of your possessions safely make it out of your old home, and into the new one, no matter how many flights of stairs we need to navigate. Even if you have a lot of large items like sofas, and furniture which can’t be disassembled, there is no need to stress, we will delicately navigate any obstacles to ensure it arrives securely without and dings, or scratches. All you need to do is pre-book the elevator for your building for moving day, and then let us know what time we should arrive. We will help to ease your burden and take care of the rest of the work, while you enjoy a coffee and relax. Perhaps you are downsizing from a house to an apartment, and still, have too many belongings to be able to fit in your new apartment. You may wish to consider storage solutions during the transition. Quick & Easy Moving is here to help, ask us for storage solutions advice today. We make moving household a breeze. We know it’s often a stressful and busy time, and it’s easy to overlook something crucial. Relax and let us take care of everything for you. Whether you have gorgeous marble statues or an upright piano, our expert furniture moving professionals are experienced with moving precious goods, and our promise to you is to treat them with the same level of care that you would. We safely pack and secure the items to ensure that they won’t get scratched or damaged during the move. All of our furniture moving professionals have completed accredited courses which include Work Cover, OHS, Safe Working and Handling Practices. Rest assured knowing that your belongings are safe hands, and will be treated with the utmost care using industry best moving practices. Allow us to make the moving process easier. We can pack your goods as we move them, taking all the stress out of moving. Our staff are happy to help and have been professionally trained to pack goods before moving while ensuring that they are fully protected, and will arrive at your new home in the same condition. No matter how big your move is, there isn’t a moving household job we can’t handle! We take the utmost care when moving your items into your new home, and you don’t need to worry about lifting or moving any heavy items in your home, or in and out of the truck. We’ll do the heavy lifting for you, and also organize and place the heavy items exactly where you want them to go. Contact Quick and Easy Moving today for a free quote!